The phone features a large 5.7-inch Full HD Super AMOLED display with a screen resolution of 1920 x 1280 pixels. 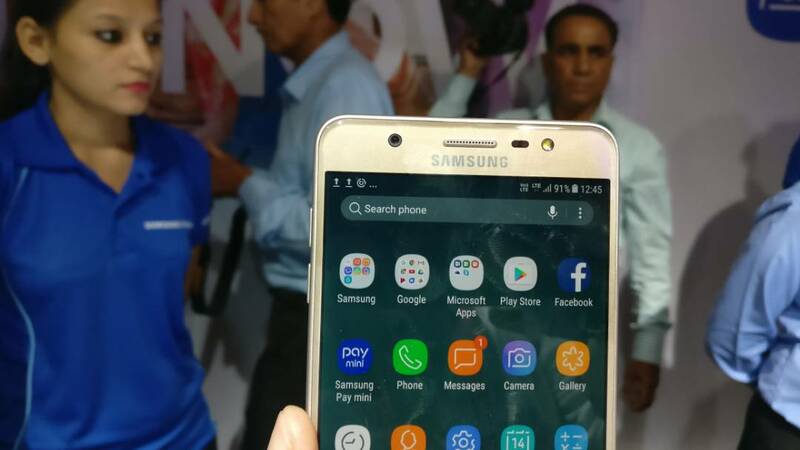 Samsung has added two new members to its J series with the launch of Galaxy J7 Max and Galaxy J7 Pro. Both of the devices comes with a price tag of Rs 17,900 and Rs 20,900 respectively. Though we have already talked about the Galaxy J7 Pro in our first impressions, it is now time for the Galaxy J7 Max. So, without further ado, here are the first impressions of the Samsung Galaxy J7 Max. Starting with the design department, the smartphone looks eerily similar to other Galaxy J series smartphones available in the market. However, this one comes with a unibody and a large screen, which sometimes makes it a bit difficult to hold. There is a home button, which also acts as fingerprint sensor along with physical navigations button at the base, while at the top, one will find selfie camera coupled with a front flash. However, the major highlight of the device is the Smart Glow ring, which surrounds the rear camera. 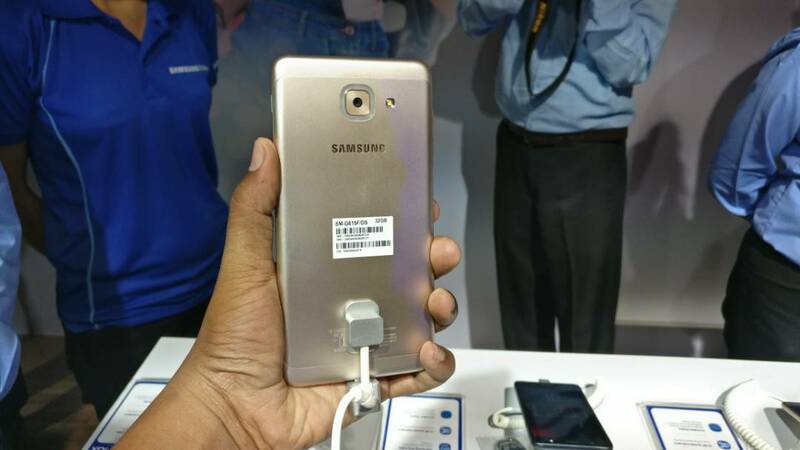 Samsung introduced this feature with Galaxy J2 (2016) last year. The notification ring light up in different colours to signal incoming or missed calls or messages. And that is not all; it also lights up when you are taking a selfie with a rear camera. The left houses volume controls coupled with dual-SIM slot and a dedicated micro SD card slot. On the right, there is a speaker grille at the top and just beneath it is the power on/off buttons. The top is bare, while at the base, there is a micro USB port and headphone jack. Overall, the smartphone is a tad bit tall in nature, and it might be a bit difficult to hold it with one hand. Coming to the display part, the phone features a large 5.7-inch Full HD Super AMOLED display with a screen resolution of 1920 x 1280 pixels. The large display goes with some good viewing angles, and it is meant for those who loved to watch movies and videos on a large screen and also for those who has a big hand. On the hardware front, the device is powered by a 1.6GHz Octa Core MediaTek MT6757V processor. It has a 4GB of RAM and 32GB of internal storage, which can be further expandable via MicroSD card. 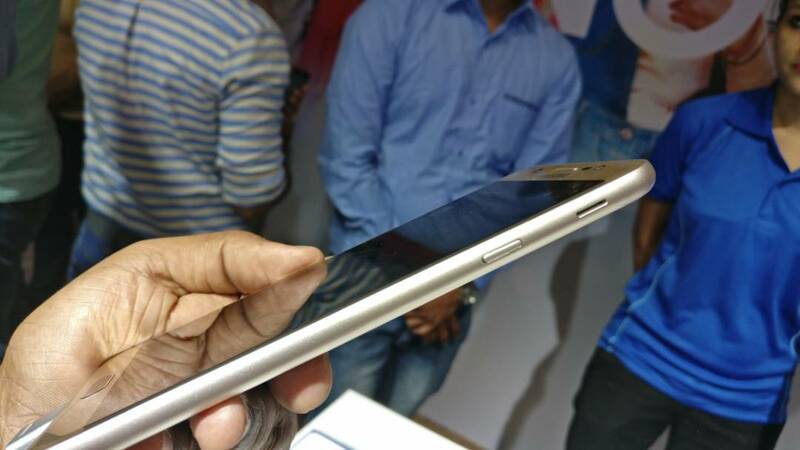 Looking at the sheer specifications, the device will face stiff competition with the likes of Honor 8 Lite, as it sports a better specs comparatively. However, it would be interesting to see the overall performance of the device during our review period. On the software front, the phone runs on the latest Android 7.0 Nougat with Samsung Experience 8.1 UI running on top of it. The user interface has a lot to offer, and we will discuss this in our detailed review. Interestingly, this is the first device to come loaded with Samsung Pay Mini, a toned version of the Samsung Pay. Through this services, users can link their Paytm and UPI account to the app, and one can make payment directly from the application. Just like Galaxy J7 Pro, the device boasts a 13-megapixel front and rear cameras with flash. The back one has an aperture of f/1.7, while the front has an aperture of f/1.9. The major highlight in the camera department is the new Social Camera, which users to quickly share photos to Facebook or on WhatsApp within the camera app. The company has added some interesting face filters in the Social Camera mode, which we have seen in the Galaxy S8 and Galaxy S8+ and there are some interesting stickers as well. The app looks promising, and we will talk about more in detailed camera test of the Galaxy J7 Max. On the battery front, the phone is loaded with a 3300 mAh battery, and on the connectivity front, it offers 4G VoLTE, Dual SIM and all basic connectivity functions. The options are pretty much standard these days. Samsung is powered by Mediatek which makes it fast and smooth making it a wonderful device. I liked the camera however the price and screen size is big.